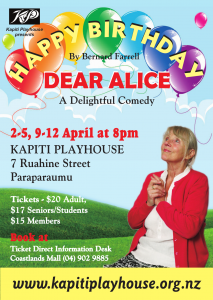 Happy Birthday Dear Alice Synopsis Added - Kapiti Playhouse Inc. The New Zealand Amateur Production Premier of this delightful comedy by Irish playwright Bernard Farrell opens on Wednesday 2 April at the Kapiti Playhouse and we thought now was a good time to add the show’s synopsis to the production page. Performances run from Wednesday to Saturday until 12 April 2014. A reminder that tickets cost $20 for Adults, $17 for Seniors/Children, with a $2 discount for groups of eight or more. 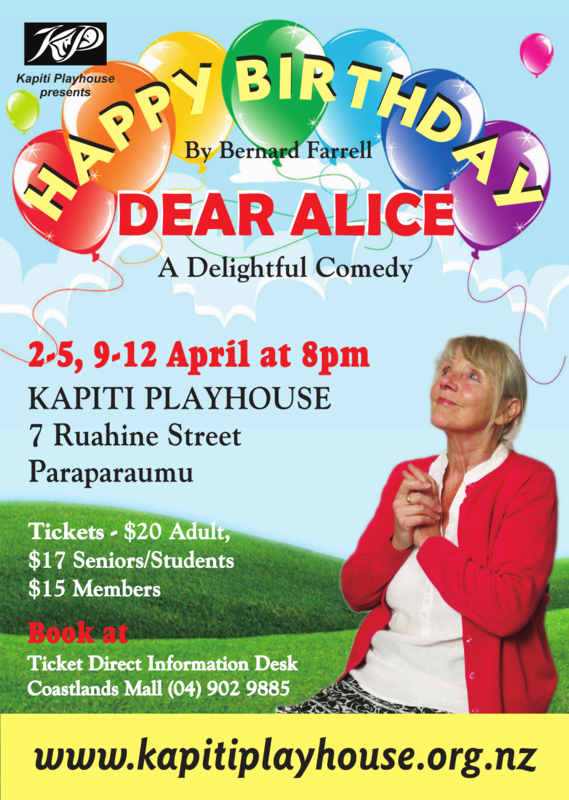 Bookings information can be found on the Happy Birthday Dear Alice production page.